Sirigen’s initial commercial and technical focus has been in flow cytometry. Numerous Brilliant Violet™ products are now available for flow users with a wide variety of specificities and colors being provided by Sirigen’s chosen partners in this market. These products transform the options for expansion of flow panel design by capitalizing on the previously underutilized potential of the now common violet laser. The new fluor delivers on the market’s need for color and brightness - the power and brilliance of Sirigen’s High Sensitivity Fluorescence™ in action. 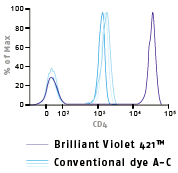 Brilliant Violet conjugates are markedly brighter than incumbent dyes for 405nm excitation yet do not increase background. 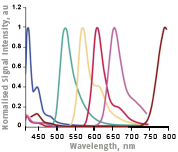 Brilliant Violet 421™ conjugates exhibit 10 fold improvements in stain index over those made with dyes such as Pacific Blue® and are compatible with standard staining and analysis protocols. Brilliant Violet™ tandems are now also included in commercially available flow products. These are in principle similar to phycobilliprotein tandems relying on energy transfer between a donor (Brilliant Violet™ polymer) and an acceptor (a traditional small molecule fluor). Brilliant Violet tandems extend the range of what is possible on a violet laser equipped system by offering numerous highly sensitive color options with members of the Brilliant Violet™ family now offering emission options all the way from blue to the near IR. Further, stain indices obtained with Brilliant Violet™ tandems are typically many fold higher than those obtained with traditional reporters. The Brilliant Violet™ family, growing all the time. Defined excitation and emission properties combined with excellent spill over and compensation commend the Brilliant Violet™ family for ready adoption in multicolor panels. In 2012 Sirigen will be introducing Brilliant products for extra lasers in addition to violet. Keep an eye on our Brilliant Blog for the latest announcements. Pacific Blue ® is a trademark of Molecular Probes.